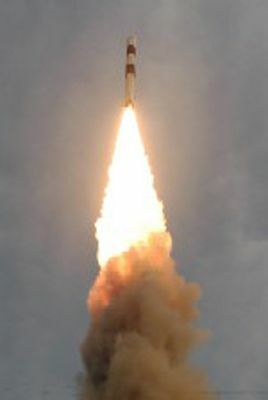 An Indian Polar Satellite Launch Vehicle launches the new Oceansat-2 and six nanosatellites into orbit from the Satish Dhawan Space Center in Sriharikota, India. A new spacecraft dedicatedto studying the Earth's oceans was shot into orbit aboard an Indian rocketearly Wednesday, marking the country's 20th successful satellite deliverymission. The Polar Satellite LaunchVehicle, flying in a core configuration stripped of its six strap-on boosters,lifted off at 0621 GMT (2:21 a.m. EDT) from the Satish Dhawan Space Center onIndia's east coast. Launchoccurred at 11:51 a.m. local time in India. The Indian Space ResearchOrganization declared the launch a success on its Web site early Wednesday. The four-stage rocket waspropelled off the launch pad by a powerful solid-fueled motor during the firsttwo minutes of flight. The second and third stages burned liquid hydrazine andsolid propellant, respectively. The PSLV's fourth stage wasloaded with extra hydrazine fuel during Wednesday's flight to increase therocket's lift capacity to orbit. The 146-foot-tall launcherdeployed the 2,112-pound Oceansat 2 satellite about 17 minutes after liftoff.Four more tiny CubeSat payloads were set free moments later. The PSLV also carried twoattached Rubin demonstration payloads for the Automatic Identification System,a communications network used to track and identify shipping vessels. ISRO confirmed the firstsignals from Oceansat 2 were received after launch. The PSLV delivered thespacecraft to the expected orbit about 447 miles high with an inclination of 98degrees, according to ISRO. Circling Earth on a pathdesigned to maximize the potential of science returns, Oceansat 2 will spendthe next five years using its three instruments to observe the planet's oceansand atmosphere. Oceansat 2 will ensurecontinuity of data now provided by the Oceansat 1 satellite, which was launchedin 1999 and is nearing the end of its life. The satellite's Ocean ColorMonitor, a wide-angle visible and near-infrared imager, will take pictures witha resolution of up to 1,200 feet and across a swath of around 882 miles,according to ISRO. Scientists say the camerawill keep tabs on water pollution, fish populations, sediment distribution andalgae. A scatterometer willmeasure wind direction and speed over the ocean's surface. This informationwill give forecasters insight into weather patterns and tropical cyclones. Oceansat 2's thirdinstrument is an Italian experiment devoted to probing the atmosphere. Thesensor will observe distortions in GPS radio signals traveling through theupper atmosphere to derive up to 500 temperature, pressure and humidityprofiles each day. Data from Oceansat 2 willbe used by Indian and foreign scientists, according to ISRO. Four CubeSat payloads, eachabout the size of the palm of a hand, were also sent into space duringWednesday's launch. Two German CubeSats, BEESATand UWE 2, were built by student teams to test new attitude control systems. ITUpSAT 1 was developed byIstanbul Technical University in Turkey to examine the performance of a newstability system and take pictures of the Earth. Another CubeSat, SwissCube,is Switzerland's first satellite and will try to detect a phenomenon known asairglow using an off-the-shelf sensor. Innovative Solutions inSpace, based in the Netherlands, provided the launch opportunity for theCubeSat missions. The company said ground stations received signals from allfour spacecraft shortly after launch, verifying they were healthy afterarriving in orbit.